This first United States gold coin is a big, old gold coin. In 2000, an uncirculated 1795 eagle was available for around $30,000-35,000. Today, the same coin would be priced at around $80,000-100,000. There are two varieties, one with 13 leaves on the branch below the eagle and one with 9 leaves. The 13 leaves variety is more common. Only 5,583 total coins were struck for both varieties. It is believed that around 5,083 employed the 13 leaves reverse while the remainder used the 9 leaves reverse. For the 13 leaves, probably 400 to 500 exist today in all grades. There are at least three gem examples that survive. Most 1795 eagles grade in the VF (very fine) to EF (extra fine) range. AU (almost uncirculated) coins are scarce but available. Uncirculated coins are rare although they are far more available than the 1796 or 1797 Small Eagle. The 9 leaves variety is usually seen in AU and appears to not have circulated much. There are probably six to eight uncirculated examples. No true proofs exist although a few of the uncirculated pieces are choice enough that they may possibly have been presentation pieces of some sort. 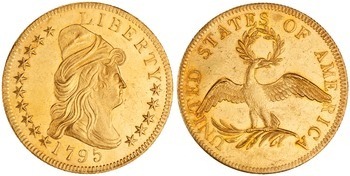 Until the establishment of the double eagle in 1849, the Eagle (or Ten Dollar gold piece) was the highest denomination produced by the United States mint. These coins were struck from 1795 through 1804 and then discontinued until 1838 when the new Gobrecht Liberty Head design was introduced. Early Eagles have proven to be very popular with collectors over the years. These coins are big and beautiful. The dates from the 1790’s have proven to be especially popular and price levels have risen to record highs during the last few years. All eagles produced from 1795 through the first part of 1797 are found with a Draped Bust obverse and a Small Eagle reverse. (FYI, there are a total of five die varieties for this issue). The 1795 tends to be the best struck and most aesthetically appealing of the Small Eagle ten dollar gold pieces. The typical example has some weakness on the obverse hair behind the ear and at the lower portion of the cap. The stars are sometimes flat at the centers and on many the denticles (little tooth-like design elements around the perimeter of the coin) are flatly impressed. The reverse shows weakness on the eagle’s neck and head and the denticles are often flat with a partially beveled appearance. The surfaces often show numerous small marks and on many of the 9 leaves coins, there are mint-made die chips and/or planchet (the round metal disk that is ready to be struck as a coin) defects in the fields. The luster is often frosty with a somewhat grainy texture. Some are known with reflective prooflike surfaces and at least a few have fully prooflike fields on the obverse and reverse. The natural coloration tends to be a deep yellow-gold. Others are seen with orange-gold or greenish-gold hues. There are a number of higher grade 1795 eagles with superb color but these are becoming very hard to find as more and more are dipped. Most circulated 1795 eagles show processed surfaces and original, attractively toned pieces are rare and worth at least a 20% premium over a typical example. There are a good number of extant 1795 eagles with acceptable eye appeal. The collector seeking one should be patient as most of the examples offered for sale at auction or at coin shows are low end for the grade. An “entry level” 1795 eagle is now worth in the area of $40,000-50,000 and a nice, solidly graded AU will cost at least $50,000-70,000+. As stated earlier, expect to spend up to and perhaps over $100,000 for a nice uncirculated example. 1. Breen, Walter, Major Varieties of U. S. Gold Dollars, Hewitt Numismatic Printers, Chicago. Breen, Walter, Walter Breen’s Complete Encyclopedia of U.S. and Colonial Coins, F.C.I. Press/Doubleday, New York, 1988. 2. Sayers, R. S., The Return to Gold., The Athlone Press, 1960. 3. Taxay, Don, The U.S. Mint and Coinage, Arco Publishing Co., New York, 1966.